When it comes to Southeast Asian cuisine, other than the Thai curries, I always opt for the stir fries. 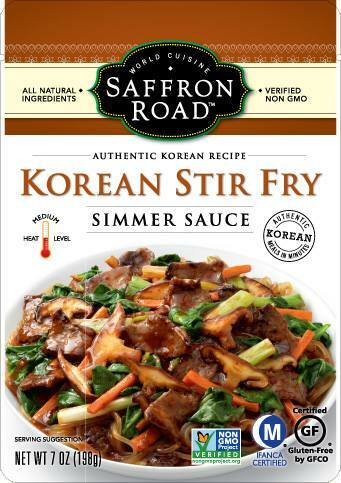 So when Saffron Road Foods sent their newly launched simmer sauces for a review I was overjoyed to find the Korean Stir fry ready to cook product in the package. I instantly thought of cooking and reviewing this simmer sauce in my blog. Preparing the simmer sauce took me less than 15 minutes from chopping vegetables to serving it to the dinner table. The result was an awesome combination of healthy homemade food with loads of vegetables and the taste of restaurant style meal. The ease of cooking it also made this simmer sauce a perfect for a date night or just when you are too lazy to go through through spice cupboard to prepare something for dinner. I prepared it with some South Asian choice vegetables – baby corn, bok choy, carrots, mushroom with an Bengali addition of some cubed onions to it. The packet for Korean Stir fry had the option of beef strips for meat, I opted for chicken and it turned out perfect. You can also use other meat like lamb, or for the vegetarian option try it with tofu. Most of the Saffron Road Foods simmer sauces have almost the same directions to prepare the food. Heat oil in a skillet, add the meat and vegetable, saute them. Add the simmer sauce and stir. Cook till the sauce starts to bubble. I feel, as these simmer sauces are used even by the novice cooks, a mention of which vegetables to use for which simmer sauce would do good. The last time I prepared Rogan Josh simmer sauce, I don’t think mushroom or baby corn would go with that. The Saffron Road Food products are all non-GMO verified products and so a re very safe. They have some of the simmer sauces available in their online store, and you can also get all their products in almost all of the large retailers throughout US. Check their store locator to choose the store nearest to you. As with the other simmer sauces from Safrron Road Food, I truly enjoyed making and eating the Korean Stir fry. I served it with some jasmine rice and vinegar dipped cucumber, and it felt like a to-go order from our favorite South Asian restaurant. Here’s how I made it. Pour in the contents of the pouch, mix well with the meat and vegetables and cook covered for 2-3 minutes or till the sauce starts bubbling. If you want to keep the gravy serve instantly with jasmine rice, else cook till the gravy is dried. Disclaimer – I am not paid by Saffron Road Foods to write product reviews in Cook Like a Bong.